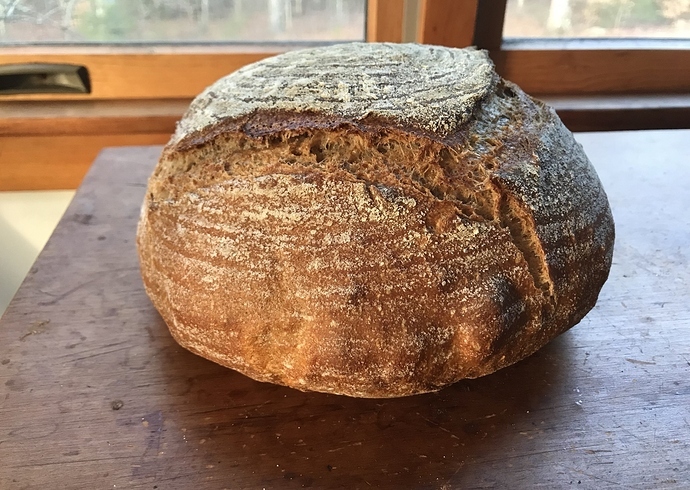 Roch – I just pulled my first attempt at this trad whole grain sourdough out of the oven, so I’m not really in a position to offer advice. However, others on this board have suggested putting a cookie sheet on a shelf right under your dutch oven or clay baker. Doing so deflects some of the heat from the bottom of your baking vessel. By the way, that’s a beautiful loaf. My first attempt at this traditional whole grain sourdough.The taste and texture are excellent. I got great oven spring, and the crumb is good and consistent despite bubbles/lumps around the circumference of the boule. This is a big loaf, compared to what I’ve baked previously. I’m looking forward to trying it out next time. This is only my second time baking sourdough so forgive me if my question seems dumb, but can I substitute the rye, spelt, and white bread flour for whole wheat and if so is it an equal substitution? I only have whole wheat flour that I mill from hard red spring wheat berries at bread flour consistency. A couple of thoughts, though: if you’ve been making a 100% whole wheat with your milled flour, but using commercial yeast … and were happy, then follow the same recipe except sub 60 grams (1/4 cup) starter for each 1/4 tsp commercial yeast. And lengthen the process. Another option that I think I’d try would be to make the “no knead sourdough” recipe/technique with your ingredients, add a bit more water and maybe some honey AND barely mix all together and then into the frig for a 24-48 hour rest, warm, shape and bake. 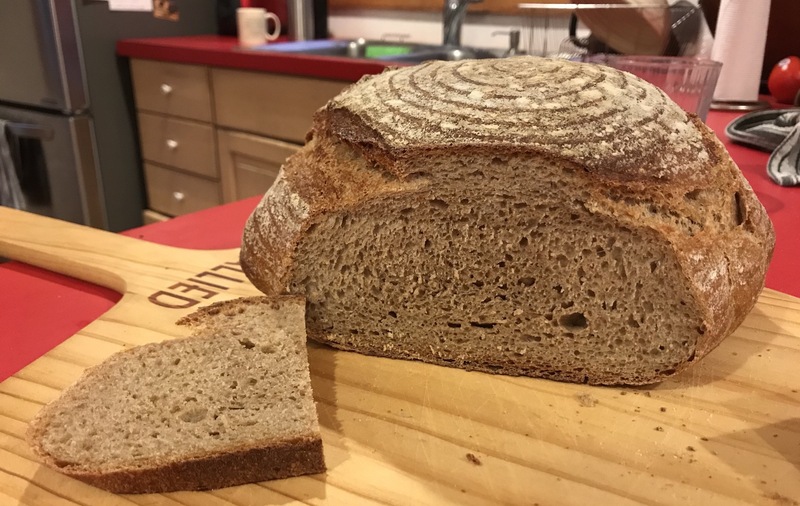 Trevor at Breadwerx has some “premix” techniques that work well with high % whole grain. I’ve made 100% white whole wheat (commercially milled white whole wheat) with some added vital wheat gluten to success. Another ingredient you might have if you are working with 100% whole wheat: diastatic malt powder? Either of those will help the whole wheat. Is it possible to cut this recipe in half and have it turn out the same? Hey Eric, … a quick question: With the sourdough breads, when you list sourdough starter in the ingredients, do you always mean a “fed”/“ripe” starter, or will the recipe work with a discarded portion? I am specifically thinking of the ‘traditional whole grain sourdough’, but also in general for the other recipes that use sourdough starter. Thanks. I always use a fed/ripe starter in my breads. A discarded portion might work just as well but I think your odds of success (well risen loaf) will be higher with a fresh starter. Are you asking because you want to use a discarded starter to enhance the degree of sour in your bread? After my first try, I thought I didn’t knead well enough. So I kneaded for twenty minutes for the second loaf, but that seems to have not helped. Then I read something in Local Breads by Daniel Leader that has me wondering. He recommends not retarding (putting the dough in the refrigerator) for more than twelve hours; after that time, the lactic and acetic acids produced in dough will start to break down the gluten, inhibiting the dough’s rise. He also does not recommend retarding any dough that contains whole grain or rye flour, because such flours are more sensitive to acid buildup in the refrigerator. Maybe the retarding is the main reason my bread seems too dense. What do you think about what Leader says? Could I leave the dough out at room temperature instead? If so, should I still let it be for twenty-four hours? Thank you for the recipe! I appreciate your efforts, Eric. JerseyJoe, My experience is the exact opposite: less kneading (very gentle) and long, mostly cold bulk. Too much or too aggressive kneading of whole grains breaks the gluten strands (whole grains because of the “sharp” bran). Mr. Leader’s theory about the acid buildup I can’t speak too but I get a loaf I like both taste and crumb by allowing time to do most of the work. See also, on this site: @Fermentada 's How to get an open crumb with whole grain sourdough bread. I just posted a bit of a rant on on the breadtopia blog on how I think about baking sourdough bread. One baker's attempt to take some of the mystery out of sourdough bread baking. @homebreadbaker, I loved the “rant”. Here’s to the wee beasties AKA our starter! I have been making this bread regularly and love the flavor. One problem - the amount of water in the day 2 part is not nearly enough. I need to increase it to almost 2 cups. It almost seems like a mistake in the recipe. Am I the only one with this problem? First … if you have a formula that works for you and makes great bread, THAT is the only important thing! You know what the dough should feel and look like - YEA! If you read all comments, you will see that some say too wet, some say too this or that … there are so many variables: flour brands, measuring, humidity, temperature, etc. That said, you referred to water in cups (volume). If you are measuring flour in volume vs weight, it might be that you just have more flour or flour(s) that absorb water differently than Eric’s. For example, the white flour I typically use is a hard red spring wheat flour that measures 38g for 1/4 cup. Many AP flours measure 30g for 1/4 cup. Additionally is flour fluffed or compacted - you can search on “flour measuring” to see variables. Measuring by weight takes most of that variance away. I don’t have issues using my flour when I measure by weight. And, when substituting a flour specified in a recipe, if I stick to the recipe weight (I’m talking recipes by an author whose weight measurements I trust), I have no issue with substitutions. Bottomline … measuring by weight is accurate, measuring by volume is not. I should not have said cups because I measure everything in grams. Using the measurements in this recipe are not even close. The dough is so stiff I cannot even mix all the flour into it. Taking into account that some flours absorb more water plus all the other variables, most of the time I only have to add about 1 T of water to make up for the difference. Ok … I’m a little confused. In your first post you said you needed 2 cups water the 2nd day (vs 1 1/4 cups which is 12 Tablespoons over the recipe) and then you write that “most of the time I only have to add 1T of water”… but, no matter: ultimately, if you are comfortable with judging water/flour/dough consistency to get the bread you like … you are good despite being different measurements than “the recipe”. 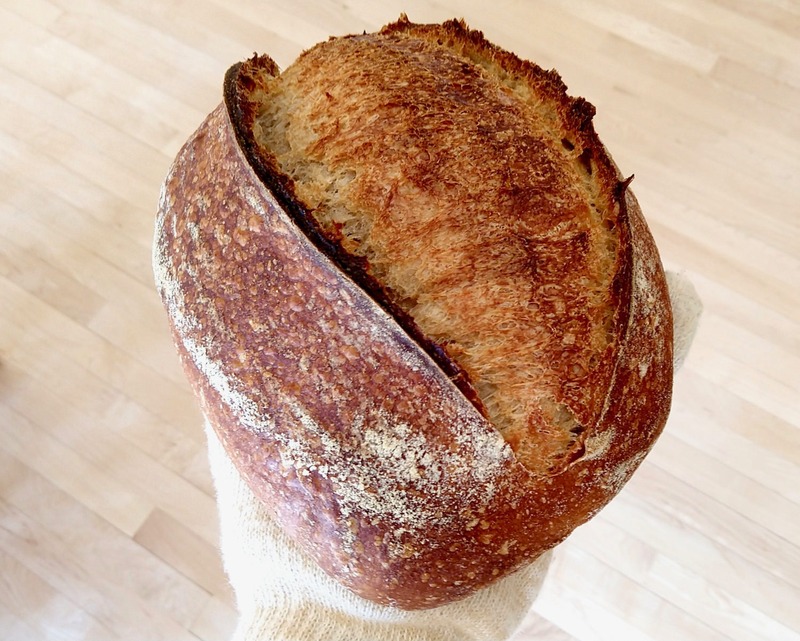 Inspired (or reminded) by this thread, I just added a little section on dough hydration to my demystifying sourdough bread baking post that @easummers recommended (thanks!). 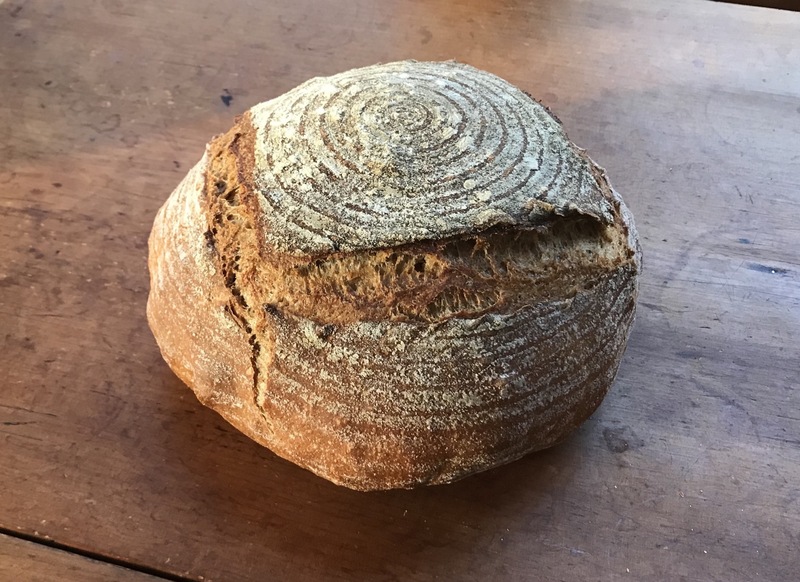 You can read it if interested, but in short, as with length of proofing time, I think that no two bakers (in their own kitchens with their own different flours) are going to get the same consistency of dough by following the same recipe. And in some cases, again, depending on your particular flour, it can be wildly different from what a recipe author sees in their kitchen with their flour and their technique. So I think you need to approach any bread recipe expecting to need to make adjustments to the amount of water you use to get a workable dough consistency. At least that has been my experience. Thank you. I apologize for the long delay in acknowledging your reply. I’ve been busy with a freelance project but also made a couple attempts at bread-baking. 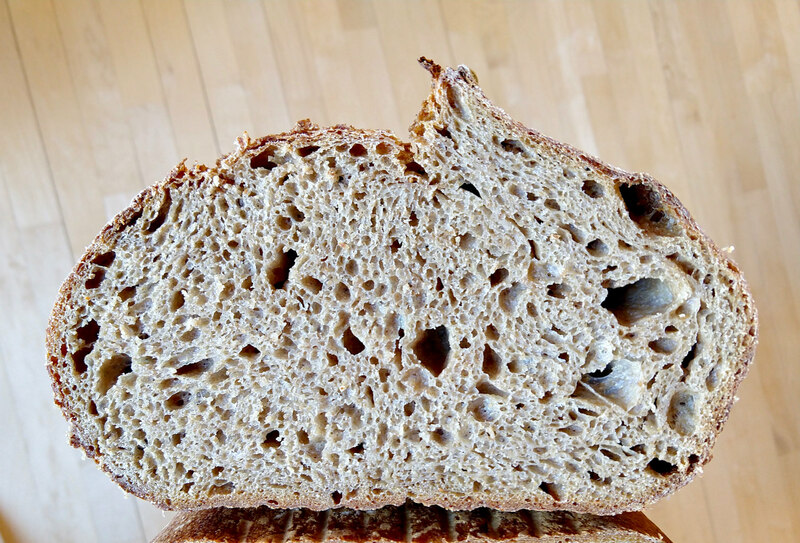 I tried a loaf following a recipe at Zero Waste Chef (https://zerowastechef.com/2015/09/17/sourdough-bread/), which turned out well, with a fairly open crumb. But then I tried the recipe here under the first link you provided; it did not turn out well. I’ll post some questions under the forum for that page. I appreciate your help! It’s a learning process for me. Thank you for your response to my post; I’m sorry for the delay in acknowledging your thoughts. I liked your article and understand that I need to develop a feel for what my dough tells me.